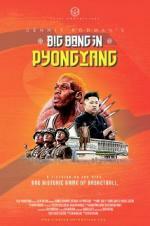 Buy or Rent Dennis Rodman's Big Bang in PyongYang (2015) Movie DVD & BluRay Online! Movie Plot: Dennis Rodman is on a mission. After forging an unlikely friendship with North Korean leader Kim Jong-un, he wants to improve relations between North Korea and the US by staging a historic basketball game between the two countries. But the North Korean team isn’t the only opposition he’ll face… Condemned by the NBA and The Whitehouse, and hounded every step of the way by the press, can Dennis keep it together and make the game happen? Or will it go up in a mushroom cloud of smoke? For the first time, discover the true story of what happened when Dennis Rodman took a team of former-NBA players to North Korea and staged the most controversial game of basketball the world has never seen.